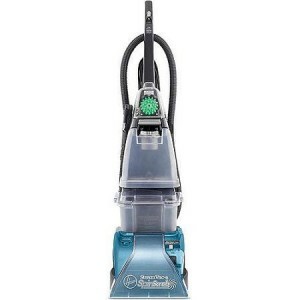 The Hoover SteamVac Carpet Cleaner with Clean Surge F5914-900 is regarded as a bestselling Hoover carpet cleaner appliance model by many users. Tested and tried for over ten years, the appliance’s performance is provided by the effective Spin Scrub technology used by Hoover and a useful features combination. In our review, we will clear up its various benefits and features; consider both customer reviews and its comparison with other carpet cleaning appliances. Counter Rotating SpinScrub Technology – The technology stands for the simultaneous action of five spinning brushes that jostle the dirt and stains off of the carpets in all directions, which is then sucked up by the vacuum. The counter-rotating brushes provide a thorough cleaning effect. Considering customer reviews, we have found out that the scrubbing has pleased many of them – though it is too gentle for grooming the carpets, yet it is strong enough for bringing out the stains and dirt. Clean Surge for Using on Stained Areas – The deep cleaning SteamVac is equipped with the Clean Surge feature to remove highly stubborn spots and stains and to clean difficult areas. When you turn on the Clean Surge button, the appliance releases extra detergent to the area. Since this button is well-placed and is situated near the appliance’s handle, it can be easily used. Multiple Brush Speeds – The appliance is equipped with three brush speed settings for using in different cleaning scenarios, for example, normal or gentle cleaning. You can turn off the brushing, or set it to high or low. Separate Tanks for Clean & Dirty Water – The appliance is equipped with two separate tanks for keeping dirty and clean water in separate containers. In the clean water tank hot water is held, which is used for more effective cleaning of carpet. However, there is no water heater built in the appliance. This feature is similar to most steam carpet cleaners. If we consider the Rug Doctor unit, it is similar to this one as it is also equipped with two separate tanks so that users can pour hot water into the tank for clean water. High Powered – The appliance’s power is 12 Amps. Its horsepower is similar to the Rug Doctor. Still, you should not expect these appliances to be considered units of the same class. The price of Rug Doctor is a lot higher as it is one of the professional grade carpet-cleaning appliances. However, this Hoover SteamVac power is worth noting since it is obviously a reason for the great performance of the vacuum. Great Handtools – The Hoover SteamVac F5914-900 carpet cleaner has cleaning hand tools and a powered SpinScrub tool as well. It allows easy cleaning of stairs, upholstery, and difficult areas. The main reason for purchasing this appliance is to clean carpets, but you can also use it while cleaning armchairs and sofas. A few consumers have also used it to clean their car upholstery, saving money on auto cleaning. Removable Brushheads – The appliance is equipped with Spin Brushes that are easy to replace and remove. Thanks to it, the brushheads can be easily cleaned under running water. The brushes can be blunted by the wear and tear over lots of uses or years. Still, you shouldn’t buy a new appliance, as you can just change out the brushes in your machine, and it will perform great again. Moreover, a variety of extra parts is offered by Hoover to replace worn-out or damaged parts. It helps to keep the appliance functioning well even if some parts fail accidently or over time. Stress Tested & Well Engineered – To provide many years of great service for customers, the Hoover SteamVac carpet-cleaning appliance has been stress tested by professionals in Hoover’s engineering laboratory in the USA. It doesn’t have any belts to break and replace. 1-Year Warranty – Hoover provides a warranty for one year for its appliance. 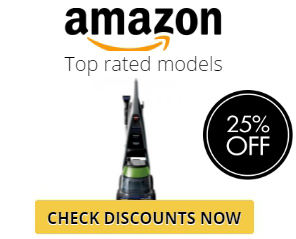 According to customer reviews, Hoover is regarded as a company with great customer support. If users face any problems, they are eager to help. So, if you’re already a customer and you run into challenges, you’d better call their customer support line that is also absolutely free. No matter, if it is pet stains, urine stains, spilled coffee, wine or other stains, which haven’t been cleaned out for years, the Hoover SteamVac appliance seems to do wonders. Though units that are more expensive have been tried by some users and professional carpet cleaning services, the results done by this appliance are rated as being better. The unit has been tested on both Berber and plush carpets, and it performed well in both cases. Great results are also reported with different kinds of carpets. One of the main questions that arise when using a professional cleaning service or a carpet cleaning appliance is how much time it takes for your carpets to become dry. And it’s not a point to worry about when using the Hoover SteamVac. It is equipped with a suction mechanism designed to draw out the majority of water from the cleaned carpets. Moreover, a heated air flows from the appliance so that the carpet dries faster. Thanks to this technology, the carpets dry up really quickly (within 3 hours) and many users are really surprised and pleased by this fact. Compared to the results of the Hoover SteamVac, professional services, and other machines are inferior in this respect, since it can take your carpet a whole day and even longer to dry up after you used them. The appliance can also be easily used and assembled. You can assemble the unit in about 10 minutes. After that, you can easily use it. The Hoover box contains an easy start guide and helpful manual. The tremendous feedback has been received by the Hoover SteamVac equipped with Clean Surge from pet owners. The appliance is quite helpful in tackling pet stains that include vomit, feces, and urine. Hoover also produces a Pet model – the Hoover SteamVac Pet Complete Carpet Washer with Clean Surge F5918900. The Hoover Steamvac F5914-900 and Hoover SteamVac Pet Complete F5918-900 units are almost identical. The SpinScrub Powered handtool also comes with both of them. The packaging is the main difference between the two units: the Pet Complete is equipped with a small Pet formula cleaning detergent bottle, and pet wipes pack. Still, the Pet Complete usually costs around $50 more. That’s why we recommend just buying the regular Steamvac equipped with Clean Surge F5914-900. You can always purchase the Pet cleaning wipes and Pet Cleaning Detergent on your own, whenever you need to, paying less than the difference in prices of the two appliances. Many users, especially those, who felt uncomfortable about the Rug Doctor’s weight and size, have mentioned that the Hoover SteamVac carpet unit is much easier to work with. It is easier to maneuver and lighter. It is great for multiple storied homes, as it is handy and light enough for bringing up or downstairs, and cleaning the stairs as well. Its weight is about 20 pounds without water so that it is one of the lightest upright carpet cleaners currently available on the market. The Hoover SteamVac equipped with Clean Surge F5914-900 is also suitable for cleaning hard floors such as linoleum or tile and different hard floors (except hardwood) thanks to a hard floor attachment. Still, user reviews on this attachment vary. The Hoover Steamvac F5914-900 carpet cleaner is a top customer choice currently. But what are the differences between this appliance and other top-rated Hoover units? #1 Rating Long History– The Hoover Steamvac Carpet Cleaner F5914-900 was released in 2000. Since that time, it has got a lot of fans and received some positive reviews. Clean Surge – It is easy to deal with soiled high trafficked areas and stains thanks to the clean surge feature. Some people don’t consider this too much of an issue. Still, we find that it is really helpful for cleaning up spots and dirty patches on the carpet. This additional tool is very practical for cleaning stains. 12 amps Motor – The older machine design has a 12 amps motor. The newer full-powered models of Hoover are equipped with a ten amps one. Though there isn’t a significant difference in performance results, some customers prefer a higher-powered machine for their homes. Compact – Being full-powered, the appliance remains compact in size and weighs around 20 lbs. It can be easily carried around and maneuvered while cleaning your carpets effectively. Great Handtools – Buying the unit, you’ll also get an upholstery tool and a powered hand tool that are both very convenient and helpful. Lower Priced – Having a great combination of features, the price tag of this appliance is quite modest compared to other home carpet shampooers of such a class. We have mentioned above that it’s actually identical to the Hoover SteamVac Pet Complete appliance, but the price is usually for $50 less. No Rinse Mode And Separate Detergent Compartment – A separate detergent compartment provides extra convenience, as the detergent isn’t mixed with the clean water. Thanks to it, you can save on detergent and rinse carpets. Older Design – As the Hoover was released a long time ago, it has a somewhat outdated design. Such newer models as the Power Deluxe demonstrate an advanced streamlined design, thanks to which it is friendlier to users. Not Wide-path – The cleaning path of this appliance is standard. Hoover also produces wide-path units providing for each cleaning stroke about 20% coverage. Aside from the good things that this Hoover SteamVac carpet cleaner possesses, there are also things that you should be aware of. No product is perfect, so we have listed here some user tips and possible problems for you to get the most out of this cleaner. Clean Brushes After Use – Remember to clean the brushes each time having used it to remove the debris and hair. Otherwise, it will gather up over time, and your appliance won’t perform as the brushes won’t rotate. Of course, the brushes can be replaced, but it’s easier to clean them and you will prolong their service time. Align Tank Lids– If you don’t align the dirty water tank lid, it seems that it can easily be opened. For a better performance, ensure that the tanks are properly aligned. Otherwise, you may face leakages from the tanks or a loss of suction. Read The Manual – The manual of any unit is worth of reading. You can find lots of useful tips in it, from how to use the appliance best of all to maintenance and storage. Reading this information will allow you to get the maximum value out of your Hoover SteamVac appliance. Cleaning Pet Stains/Tough Stains – You should use your machine according to the instructions provided, but while running forward, do it slowly, even more slowly than when you pull back. To add extra power, you can turn on the Clean Surge button, and go the cleaning strokes at least twice for thorough cleaning. If there is an opportunity, pretreat the carpet using a pretreating detergent such as the Stain Spray Cleaner and Hoover Pet Plus Spot. Use Hot Water – Since the appliance accommodates the usage of hot water, you should use this feature for better cleaning power. The water may be used as hot as possible, still without going above 140 degrees Fahrenheit. This carpet cleaner is recommended to be used with the same branded detergent. Hoover states that it is important for preventing risks of component damage or fire. Still, some users are happy with using other brands having ignored this advice. And those users, who use Hoover detergent, mentioned overwhelming results, indicating that the detergent works amazingly well and leaves a good smelling carpet. Therefore, to be assured of the results and have a peace of mind, we recommend using Hoover detergent. At the moment, many best-selling cleaning detergents are produced by Hoover that carpet cleaner appliance users adore. We can recommend the Hoover Platinum Collection Pet Plus Carpet-and-Upholstery Detergent for heavily soiled carpets to get maximum cleaning power. The Hoover CLEANPLUS 2X Concentrated Carpet and Deodorizer Cleaning Solution can be a great choice for normal carpet cleaning. Hoover SteamVac customers frequently purchase and use both of these solutions. So, Why Is the Hoover Steamvac Carpet Cleaner F5914-900 a Good Choice? All in all, the Hoover Steamvac With Clean Surge is an astonishing choice if you are interested in purchasing an effective, easy-to-operate and value-priced home carpet cleaning appliance. Though its design may seem somewhat outdated, it still has a motor with 12 amps power and is very easy in usage. This appliance performs great for both homes with soiled carpets and homes with pets.